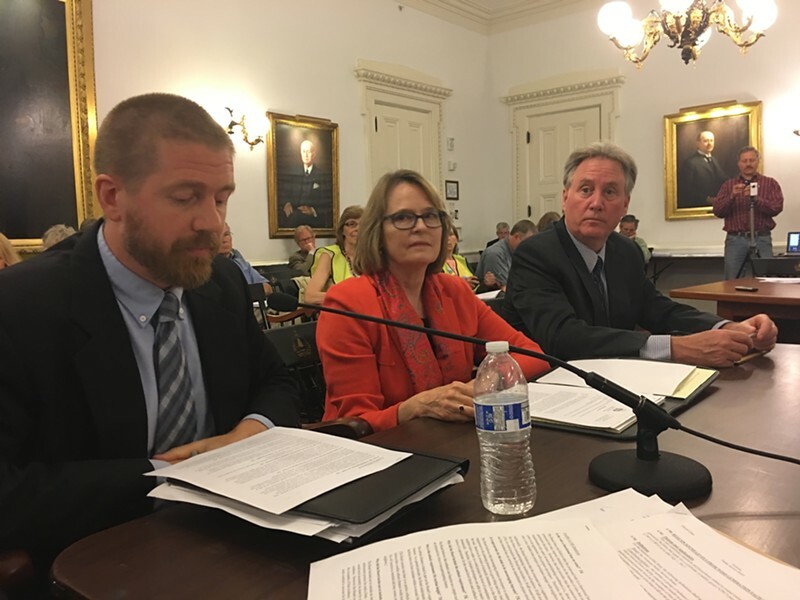 Public Service Board utilities analyst Tom Knauer (left), PSB member Margaret Cheney and PSB staff attorney John Cotter testify before LCAR on Thursday. A committee of the Vermont legislature has postponed action on proposed noise rules for wind turbines until late October. The Legislative Committee on Administrative Rules heard three hours of testimony Thursday morning. As the noon hour approached, members discussed postponing a vote until its next meeting on July 6. But two members — Sen. Joe Benning (R-Caledonia) and Rep. Linda Myers (R-Essex Junction) —will be taking long vacations this summer, and they requested postponement until the full committee can meet again. That's not until October 12. This was the second delay in the process. LCAR heard testimony at its previous meeting on June 8, but decided another hearing was needed to give the matter its due. The current rules are temporary and were set to expire on July 1; they will now remain in effect until at least October 26 unless the committee reaches a decision before then. Funny thing is, it's clear from the tone of the discussion that a majority of LCAR members plan to vote against the rules, which would mean sending them back to the Public Service Board for a rewrite. That could have easily happened on July 6, if not for the delay request from Benning and Myers. Who appear to be the only members in favor of the rules. The PSB crafted the temporary rules as well as the proposed permanent rules due to a legislative mandate. The permanent rules would impose noise levels of 42 decibels in the daytime and 39 decibels at night, and would also impose a rule that large-scale turbines must be "set back" from nearby residences. That requirement is 10 times a turbine's height; since modern turbines are as much as 500 feet high, the setback standard is nearly one mile in all directions. Wind advocates have called the rules a virtual death knell for large-scale wind energy in Vermont. The hearing ended with something of a shock over the lengthy delay. It had opened with another shock: The Public Service Board had sent a letter to LCAR earlier this week saying it would acquiesce to the elimination of the setback requirement if LCAR members wanted. The letter was received just before the deadline for submitting documents to the committee, and had not been publicly announced beforehand. Hence, all the witnesses were unaware of the possible change until the hearing began. It's a bit of a head-scratcher, in terms of both timing and content. Why so late? And why, if the PSB rulemaking process was so deliberate, exhaustive and thorough, is the board so willing to dump half of its product on short notice? PSB officials sought to draw a precise line between proposing to dump the setback rule and expressing a willingness to do so. "We continue to think that the setback is a very useful and simple tool to address sound and we continue to think it should be in the rule," said PSB member Margaret Cheney after the hearing. "Nonetheless, we also think that the sound standards, which are the other half, are also protective. So if LCAR chose to ask us to remove the setback requirement, we would be amenable." Earlier, Cheney had told the committee, "We believe the sound standards [alone] achieve the same goal." If that's true, then why propose both standards? "Setback is a simple, understandable tool," explained PSB utilities analyst Tom Knauer, adding that sound monitoring is a complicated technical process. During the hearing, Cheney and PSB staff defended the proposed rules, setback and all, while several committee members posed sharp questions. 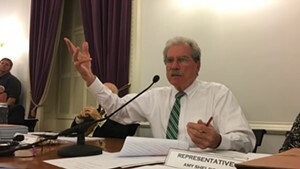 "The rules are supposed to be about sound," noted Sen. Mark MacDonald (D-Orange), the committee chair. "This appears to have drifted into areas that have nothing to do with sound." "I disagree," replied PSB attorney John Cotter. "The board took aesthetics into consideration, but you must differentiate between visual aesthetics and sound aesthetics. Sounds can have aesthetic auditory impacts." And Cheney insisted that "the setback standard is not related to the visual impact of turbines." Board officials also fought back against the idea that the rules would be an effective ban on ridgeline wind, indicating that developers could seek buy-in from every nearby resident or file for a waiver from the PSB. That's right — if a single person living near a proposed turbine objected to the development, it could not go forward. Its hard to believe that such a standard would be seriously proposed for any other kind of development in Vermont, from a dollar store to a nuclear plant. It's true that a developer could apply for a waiver, but gaining approval from the current PSB would appear to be a long shot. Developers don't take risks like that. It's all likely to prove academic, since LCAR is almost certain to vote down the rules sometime after leaf-peeping season. At that point, the PSB would have to resume work on a new set of rules. Given the fact that the board and the Scott administration take a dim view of ridgeline wind and most legislators are in favor of renewable energy including wind, it's going to be very tricky to find a set of rules acceptable to all parties.